The story of Indiana’s 66-51 loss to Nebraska Monday night can be told through the frame of the 3-point arc. 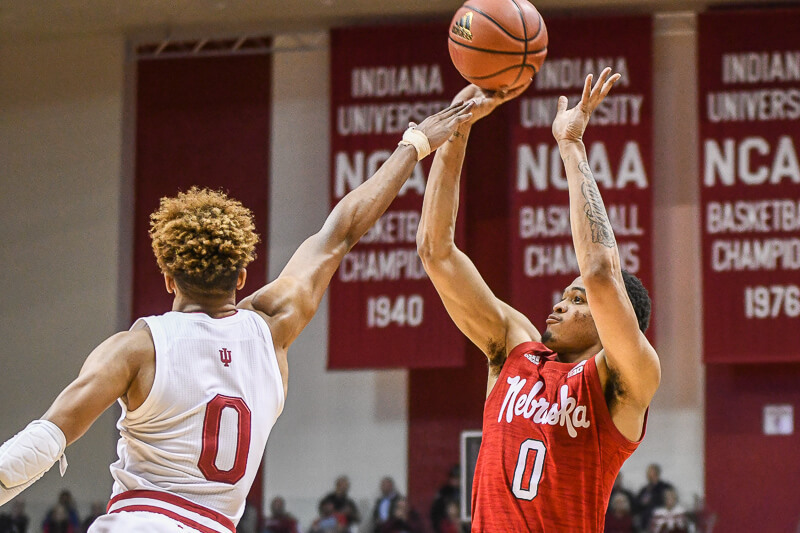 The Cornhuskers (8-of-24 from deep) outscored the Hoosiers (2-of-14) by 18 points from behind the line, a margin that would have made up the 15-point deficit that decided the game. But the impact of the two teams’ shooting extended well beyond mere misses and makes – it was evident in the way the two offenses operated on the whole. Nebraska, who shot over three percentage points below its season average from distance, didn’t punish the Hoosiers as thoroughly as it could have, but the willingness of its shooters to take open jumpers and the threat of those shots going in forced Indiana to pay them mind. Much of the value of bigs like Isaiah Roby and Isaac Copeland isn’t just in whether they make their jumpers or not, but whether they take them at all. Indiana had to respect nearly every Cornhusker as a shooting threat, and that created space for Nebraska’s playmakers to work. Indiana, meanwhile, found its allies to the basket muddied by help defenders sagging off of non-shooters like Justin Smith or Zach McRoberts. Nebraska took away Romeo Langford’s sight lines early in the game, much the same as Maryland did on Friday, only Langford never found the same rhythm he did in the second half of that game. The Huskers’ 1-3-1 defense slowed Indiana’s offense to a halt at times, as Nebraska could more liberally collapse to the middle of the floor and bother IU’s playmakers. Defensively, Indiana did themselves no favors. Rotations were sloppy from the first play of the game to the last, and even amid a five-minute scoreless stretch in the first half, Nebraska generated good looks that simply didn’t fall. IU lost track of shooters regularly and allowed bigs to casually slip to the basket with no one there to challenge at the rim. A defense as complex as Indiana’s requires that all five players be tied together constantly. When a big man rushes to hedge a ball screen, he must trust that the three defenders behind him will cover for him as necessary. Indiana didn’t play that way on Monday, and thus every crack or slip-up was magnified. A simpler scheme – one that doesn’t require bigs to cover quite so much ground or rotations to be quite so long – could help prevent such frequent breakdowns. Perhaps a change in approach might have helped Indiana plug the holes that Nebraska so readily attacked. Ultimately, Indiana’s biggest problem on Monday was its effort and an apparent loss of identity. Indiana lost yet another rotation player Monday night as Al Durham exited the game with an apparent leg injury after playing only six minutes. By the end of the game, Miller had resorted to a six-man rotation, with McRoberts, Devonte Green, and Rob Phinisee cycling in and out of the lineup to buy each brief moments of rest. That approach is not sustainable for the entirety of a season. Langford, Juwan Morgan, and Justin Smith rested for a combined three minutes in the second half as Indiana got virtually nothing from De’Ron Davis and Evan Fitzner, and those three were clearly worn down by the end of the game (at which point the result was no longer in question). Clifton Moore provided an important spark in three first-half minutes, followed by a less eventful two-minute spurt in the second (Miller even rolled out a Moore-Fitzner frontcourt for a minute), and could be an important part of IU’s rotation moving forward. That itself is a bleak assessment of Indiana’s available depth, but Moore doesn’t need to be anything more than passable on either end of the floor to provide a significant lift. Simply having the ability to spell Langford or Morgan without the offense falling off a cliff would be, comparatively, a massive luxury for a depleted team. Jerome Hunter is out for the season; Race Thompson is out indefinitely; Jake Forrester isn’t ready for real minutes; Davis is banged up and Fitzner is effectively unplayable against certain matchups. But Morgan, Smith and Langford cannot carry this much weight for the rest of the year. Indiana just needs bodies. It is worth at least trying Moore or Forrester for stretches alongside a more capable player. Bring Damezi Anderson back from exile, if only for five minutes a game.